From 2011 until 2014, BICC worked with the government of South Sudan to improve the management of state-owned arms and ammunition. In BICC Working Paper 1\ 2014 Luuk van de Vondervoort evaluates this BICC advisory project on state-owned arms control. The difficulties related to improving arms management, also known as physical security and stockpile management (pssm) are not unique to South Sudan—although the country does present an especially difficult environment. Arms and ammunition management is still weak, with dilapidated infrastructure, untrained staff, and lack of clear and unified rules and regulations. The situation is further complicated by limited institutional capacity to instigate and manage change initiatives, as well as a lack of clarity over which government institution is supposed to drive change. Although awareness had increased and numerous positive developments had started, the situation has again deteriorated with the outbreak of hostilities in December 2013 and the subsequent large-scale proliferation of small arms. 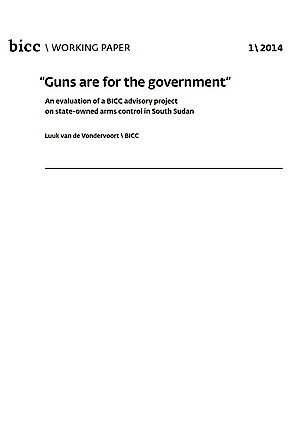 The report “Guns are for the government” evaluates the project results, and tries to draw lessons for interventions on arms control in the future, not only in South Sudan but also in other countries.